This week over on Cowgirl's Sunday Stamp'en Challenge the challenge is to make any card as long as it's not a square or rectangle. As you can see my card is a Teapot shape and the beautiful image is from CJ at Cowgirl Up Designs. This is 1 of a series of Teacup Fairies. Unfortunately, my mojo deserted me when I made this card and I know I haven't done this little lady justice. I'm sat here now looking at her and I can see where I could have used some stickles and some glossy accents. 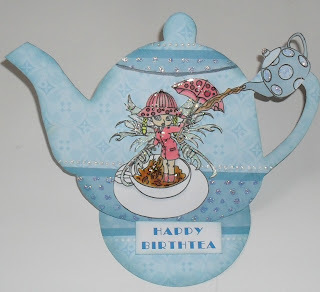 I cut the teapot on my Craft Robo using the little teapot on the image as my template. The image was coloured with Copics and Promarkers. I've gone back and added stickles, Anita's 3D gloss finish and liquid pearls and as usual I couldn't wait for them to dry so I ended up putting my hand in it (again). Here are 'before' and 'after' pictures. You may have to look closely but the after card is definitely more sparkly. Our Sponsor this week is DELICIOUS DOODLES who are opening a new shop on the 20th September. The images are by a very talented lady called Teri and Teri has decided to have a DT of her own details can be found at the link above. For the moment though you can hop over to Teri's blog to see some of her wonderful creations. ohhh wowwwww!!!! getin crazy here!!! that is sooooo cute and wonderful!!!!! jeahaaaa!!!! Hiya Poppet. This is just so cute and gorgeous. I love the teapot shape and the colours. The addition of the stickles and your cute image makes it really stand out, and I just adore that mini teapot tag, genius. Love it all. Happy crafting. 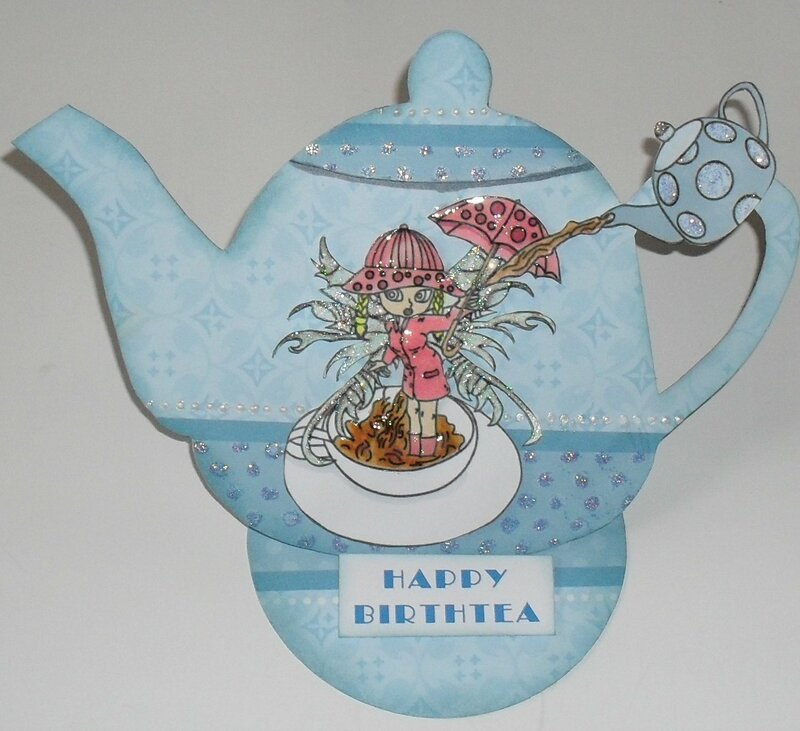 Hope youa re ok.
Poppet this is fabulous just love the teapot Easel!! The colours are fab too!!! oh my word!!! how gorgeous is this???? love it! thank you sooooooooo much for joining us at glitterbabe's challenge! 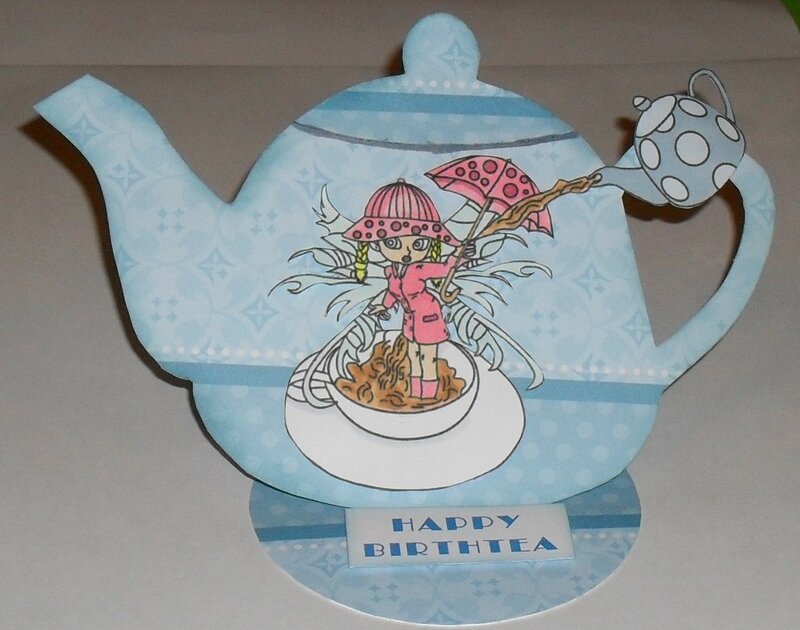 Lovely teapots...thanks for joining the challenge at Daisy Doodles. So fun - just love it! Thanks so much for joining us this week at PaperPlay Challenges. Poppet - I love the added sparkle! The teapot is too cute. I love that you put the teacup on the teapot. Adorable card! I love the teapot shape and the images you have used go perfectly with it! Thanks for joining us on PaperPlay this week! This is awsome!! What a fabulous card!! Love the tea-pot!!!! Great work!